We have been riding in Oaxaca for the last couple of weeks, it has been amazingly beautiful and interesting (the 'good' kind of sick), but I have also been struggling with some unfortunate GI problems (the bad kind of sick). This has slowed us down considerably, but fortunately I am feeling just about normal again. Having lost about a week of riding all together our chances at getting to Brendan and Kristi's wedding in Costa Rica, just by bike, have been shot. So we had to make the agonizing decision of how we are going to get to the wedding. In the end, we have decided to fly from Guatemala City to Costa Rica for a few days, and leave our bikes in Guatemala. 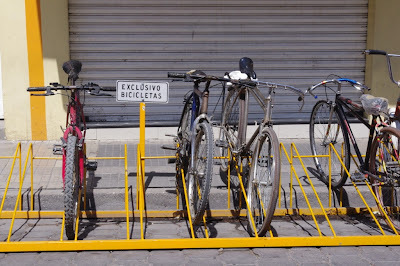 We will then return to Guatemala City and carry on, this way we won't miss out on riding any part of the route. We are now back to sea level after spending over three weeks in the mountains. It is a lot hotter, and windier down here... But we had our first swim in a while yesterday...which was blissful! The morning after our last update I woke up feeling pretty sick to my stomach. We decided not to get on the bikes, which was a very good plan because I spent the entire day in bed or hovering over the toilet or a bucket, it was pretty unpleasant. The next day I was completely drained, but feeling a little better; however it took all my energy to walk across the street to get a drink, so we had to stay put again. The following day I was feeling restless, and although still really tired, I couldn't stand the boredom of another day in a hotel room so we carried on. Peddled about 60 km, which thankfully was mostly downhill to the next town; that took just about everything out of me, and the next day I needed to rest again...and I was extremely frustrated. I went to a pharmacy and got some antibiotics, because my symptoms were persisting longer than a 'normal' bout of food poisoning. We were started to come to terms with the fact that we were not going to make it to Costa Rica on the bikes alone, and that we would need to come up with an alternate plan. We weighed our options...taking a bus now, later, flying...none of them were particularly appealing. We considered asking Brendan and Kristi to postpone the wedding, but thought that they, along with the 50 people with flights booked, might not go for that plan :). So in the end we decided to ride to Guatemala City, and fly from there to Costa Rica, then return to our bikes and carry on. Although this is not the cheapest option, it feels the best, as we won't be skipping over any of the riding. We are so glad that we did not skip over the stretch of riding before Oaxaca city, it was easily the most beautiful countryside we have experienced in Mexico yet. It probably helped that we were off the Cuota (toll road/big highway). The route that we choose was a little rough at times, with some majorly steep climbs, but it was quiet and stunning. It was also the better choice since I was still sick, because we passed through a town or village every 20-30 km, unlike on the Cuota when we would sometimes go up to 70 km before the next exit. On the way to Oaxaca we spent a couple days gradually descending into a valley, aware that we would need to climb our way back out before we reached the city of Oaxaca. As I mentioned the road was a little on the rough side at times, which led to the attachment between my bike and front rack snapping. It was on our way out of the town of Teotitlan that I noticed, so we peddled around until we found the local bike mechanic, Jorge. Jorge was brilliant, he didn't have the part that was needed to fix it, but instead used an old bike pedal - now it is much stronger than it was to begin with! After he spent about an hour fixing my bike he refused to accept any money for his work, saying that he would have thrown out the old bike pedal anyways. This is the type of kindness that we have seen again and again on this trip, and are so grateful for. With a new and much stronger rack, and with my body starting to heal a bit we began a very very long climb out of the valley. We would climb 1,700 meters in 40 km. This would be our longest ascent yet, and I was feeling a little scared especially since I was not in peak condition. It turned out to be manageable. Somehow, after about an hour of climbing you get used to going 6 or 7 km and hour, and just plod along enjoying the scenery. It helped that as we gained elevation the temperature decreased. We made it most of the way up in one day, and decided to stop at a little ranch that was serving food and ask about camping. They were more the happy to have us, and we ate the best freshly made tortillas we have had in Mexico yet! We finished off the climb the next day, and then descended into Oaxaca City. It is a beautiful city, but also pretty touristy. This was strange because we hadn't seen another tourist since Guadalajara. The prices were a little higher here too, maybe because of all the gringos... Anyways, we did enjoy our time in the city, we ate some delicious food, pedalled (without our stuff!) up to the hill top ruins of Monte Alban, and visited a lot of incredible art museums. This stretch took us back down to sea level. One would think that we would have a lot of downhill action, which we did, but we also had a lot of uphill. This was because we had to cross several mountain ranges to get back to the coast. So, we would descend steeply into one valley only to climb back up the other side. So, even though a greater percentage of the Km's were downhill, a much greater percentage of saddle-time was spent climbing... Such is the nature of bike riding :). On the way out of Oaxaca City we visited what is purportedly the largest tree, in diameter, in the world in the town of Tule. It has a 14 meter diameter...it was pretty enormous. Here we met another bicycle traveller, sort of. Danny, from Germany, had spent eight and a half months travelling by bike around South America. In Columbia he was running out of time, so he sold his bike and carried on by public transport. It was wonderful to talk bike travel with someone... We haven't seen another bike traveller since before San Diego! We continued on, and passed the 'Mezcal Capital of the World', the town of Matatlan. That night we had our first sampling of Mezcal...pretty powerful stuff. The festivities for El Dia de Los Muertos and Todos Santos began when we were still in Oaxaca City. The actual celebration days are November 1 and 2, but the festivities begin about a week before this. It is kind of like Halloween because the kids dress up and ask for candy and/or money...but it is so much more. In the towns that we stayed in on Oct 29 and 30, there were parades with costumes and music and a whole lot of fun. On Oct 31 and Nov 1 the main squares were filled with people and flowers, sweet breads, and fruits for sale. These items were bought and brought to loved ones grave sites, the main purpose of the festival being a celebration of the dead. It really is a beautiful thing. We decided to celebrate in our own little way, and on Oct 31 and Nov 1 we rode with masks on the back of our heads, until it got a little uncomfortable and we strapped them to our bikes. People thought it was pretty hilarious. Since we are not on such a tight schedule, we have opted to take a few side roads to switch it up a bit, and avoid some in town riding. This always takes a little longer than the main road, and is a little rougher...but pretty interesting. We took one side road after the town of Jalapa that skirted a beautiful lake, and then went along a river. It started out as a freshly paved road, but became more and more rough as we carried on...making us wish we had mountain bikes. We wove through little villages and farms. We encountered another such road yesterday as we tried a side route out of the town of Juchitan. Again, it started out with fresh pavement, but the pavement got progressively worse, then disappeared altogether. I should also mention that we were biking through a wind farm....with aptly named towns of 'La Ventosa' and 'La Venta', and the wind was not helpful....at all. Progress was slow. Last night we arrived at the home of a Rodrigo and his family, warmshowers hosts. They are incredibly kind and welcoming. As we pedalled into town we were directed by multiple people to his house, apparently he is known in town for hosting cyclists. Since the Todos Santos celebrations were wrapping up last night, we went to the grave yard with the family and joined in the party. We were given beer after beer... And the kids thought that we were hilarious. It was a pretty incredible experience to be in a grave yard that was so full of life and positive energy, where everyone was honouring the lives of those that have passed with a celebration... Let it be noted that this is what I would like to happen after I die :). Today we rest. The family invited us to go with them to run errands in Juchitan, but since we were just there yesterday we opted to stay put and relax a bit. We have about 350 km before we reach the Guatemalan border...hard to believe. From there we will head back into the mountains...and the cool air, ahhhh! but first, we hope to have a few ocean swims!